Join Now. Become A Member - It's Free! Order Online! Fast. Friendly. Simple. No Minimums! 50,000+ Products. Over 4,000 On Sale each month! Pick up your order at one of our stores - No Shipping Charges! "Split" cases w/ other members (you don't have to know them. Our software finds others to help you get just what you want). Pay by cash, check, VISA, MC, or Food Stamps when you pick up your order - Not Online. Forget to order something? Shop in our stores. Open Every Day. Quality Products at Prices You Can Live With. This Is An Outgrowth Of The Whole Organic Catalog®. For more information, please read our General FAQ. Questions? Drop us a note or call 757-467-8999. Help Wanted! Stores. Some Available Online Only! NOTE: Member Online PreOrder Prices May Be Less Than Flyer. Log In. Check Actual Sale Prices! 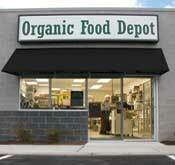 The Organic Food Depot® Healthy Clippings Coupon booklet program has been discontinued by our suppliers. You can still clip coupons from magazines, download them from manufacturer websites, etc. Your Link To Healthy Savingstm!